Over the years, we have seen co-working spaces sprung up in our Kingdom to help further the sense of community within entrepreneurs and startups in the tech scene. Some examples are TRYBE, a blend between a coworking space and makerspace, EmeraldHub, a diverse space for co-working and events, and ImpactHub, a laidback startup space with various workshops for all. 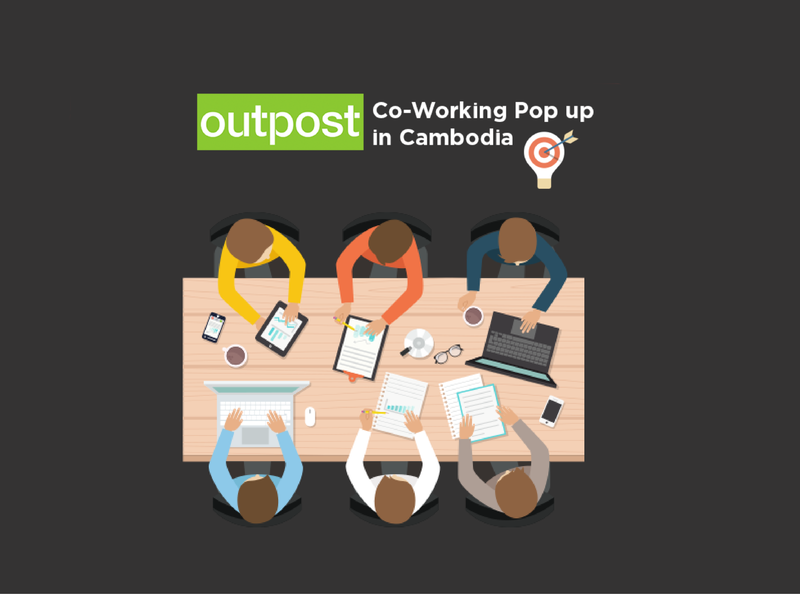 And now, another has literally ‘pop up’ into the scene – Outpost, a Bali-based co-working and co-living community has announced that its first international pop-up will be in Cambodia, at the Green Penthouse. As the pop-up title suggests, Outpost Cambodia would open its doors for 6 months, offering boutique coworking in the luxurious setting of the Green Penthouse that is wreathed in wildlife inspired by Cambodian jungles. Phnom Penh was chosen as the location for their very first international pop up as there has been an increasing trend in destination coworking. “Destination co-working means people can really throw themselves into their ideas and projects, but it’s also about inspiration, adventure, and enrichment. Our mission is to create productive, collaborative spaces in culturally-rich destinations. Giving our members the opportunity to share business ideas and develop new practices in the midst of a different culture is really exciting not just at an individual level, but at a global level, too. It creates a real innovation ecosystem,” expressed Outpost co-founder Bryan Stewart. And indeed, at this point, Cambodia’s rapidly developing startup and business scene is not unfamiliar to many. With organisations like Cambodians in Tech that connects entrepreneurs with Silicon Valley, and startups like Khmerload being the first Cambodian startup gain an investment from SV, coworking spaces are definitely an asset to the many brilliant minds seeking for productive working spaces in our country. To find out more about this unique, co-working ‘pop up’ concept, Geeks in Cambodia had the great opportunity to have an interview with Mr Bryan Stewart. The following interview has been edited for length, flow and clarity. Could you share with us more on destination co-working, and the concept behind having pop-up locations that offer a week-/month- long experiences? B: As technology and workplace dynamics change, people are increasingly free to choose where and how they work. Generally, the explosive growth in coworking is due to these trends. It is an escape from the traditional cubicle office. We believe that the next step in this progression is the freedom to choose where in the world you will work, and to no longer be confined to typical business cities. People seek out a location independent lifestyle for all sorts of reasons, such as adventure, inspiration, establishing new relationships or finding new opportunities. Destination coworking provides the enabling infrastructure and community so that people can be productive and successful while travelling. At Outpost, we focus on providing inspirational environments for people to be productive in idyllic destinations, either rich in a natural environment or local culture. What was the reason behind having these pop-ups and sessions that last a few months as opposed to having physical, long-term co-working spaces? B: We are a young company in a new and quickly evolving business area, so are eager to experiment and learn. Similarly, what we offer is lifestyle design, providing new and authentic work as well as living environments for our members. A pop-up is a great opportunity to achieve these goals, to experiment and to offer our members something fresh. What really excites us about this particular space is that Phnom Penh has a young and vibrant community of new entrepreneurs and co-working enthusiasts. We see a great opportunity for our space to serve as a venue for the local community of entrepreneurs and long-term expats to mix with our existing community of more short-term location independent workers from around the world. Although our pop-up is for a limited duration, the Green Penthouse will continue to remain a long-term serviced office space for local entrepreneurs, tech and other companies. The Green Penthouse is an extraordinary building, an intelligently designed vertical forest, five floors of office space with a penthouse on top, glassed in with views of the Mekong and Tonle Sap Rivers. It is an oasis of calm only minutes from the center of Phnom Penh. How do you think co-working and co-living spaces are beneficial to startups and entrepreneurs? B: You can’t come up with a new business idea without testing assumptions, and you can’t build a business in a vacuum. It requires the interaction between curious and driven people. Co-working and co-living spaces, in addition to providing the necessary work and living infrastructure, are intentional communities of self-selected people who come together for particular goals. These spaces provide an opportunity for people to cooperate and collaborate. One element that I think is essential to the creative process is diversity. People of diverse backgrounds and viewpoints coming together in a supportive environment can be very powerful. That is what we created Outpost for, so both locals and people from around the world can collaborate and be productive. What are your thoughts on the Cambodian entrepreneurial and co-working space landscape, and how did that lead you to choose to set up an Outpost in Phnom Penh? B: My first visit to Cambodia was a little more than ten years ago, but it feels like a lifetime of difference in regard to the amount that has changed. There is a new and exciting entrepreneurial buzz, and people seem genuinely more optimistic about the future. We were on the look out for up and coming destinations that are not yet on people’s radar screens, and think Phnom Penh is just such a place. 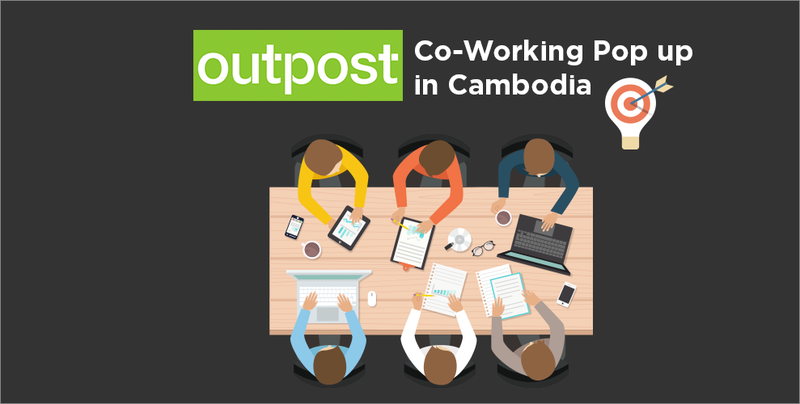 In Outpost’s 6 months of operations in Cambodia, what are some goals you would like to achieve with your space? B: First off, we would like to provide a quality space that is unique and interesting, not just for our current members, but also for local Cambodian entrepreneurs and businesses. The rise in startups and entrepreneurship in Cambodia is indicative of a larger trend throughout much of Southeast Asia today. Ourselves, being a Southeast Asian startup from Bali, believe we can serve as a bridge to increase communication and collaboration within the region. So we plan to run several events with a Southeast Asia focus. We will also bring several entrepreneurial, tech and other digital nomad groups through Phnom Penh during this period. Of course, we would love during our time here to see a new business or two between Cambodian and international founders be created in our space. And there you have it – “co-working spaces” may very well be another word for a hub of creativity and ideation. Patricia Darmoto, Outpost’s Community Manager, also reveals that they are currently working with local partners to host an up-and-coming Cambodian start-up at Outpost Cambodia. It is great to see startups like Outpost making the positive effort to cross boundaries and improve the region’s entrepreneurial ecosystem. Outpost Cambodia opened its doors on 17th July. For more information, please visit their website: www.outpost-asia.com or https://www.thegreenpenthouse.com.